Toast the pita bread in your toaster oven until dried and crisp but not browned. Heat the olive oil in a large pan. Break the pita into pieces and put into the heated oil. Fry briefly until browned, tossing frequently. Remove from the oil and place on paper towel. Sprinkle with salt, pepper and sumac. In a large mixing bowl, combine the salad ingredients. In a small mixing bowl, whisk together the ingredients for the dressing. Dress the salad with the vinaigrette and toss lightly. Lastly, add the pita chips and toss one more time. Serves 4-6. To cook the beets: place the unpeeled beets in a medium saucepan, and cover them with water. Bring to a boil, reduce heat and simmer until fully cooked, about 45 minutes, or until a knife inserted indicates they are tender. Drain and cool. Preheat the oven or toaster oven to 350°F. In a small bowl, toss the almonds with the maple syrup and sugar. Spread them evenly on a foil-covered baking sheet and bake until caramelized 10-15 minutes. Set aside to cool. Break up the clumps into small pieces. Remove skins from the beets with a peeler or a knife, cut into cubes roughly the same size as the watermelon and tomatoes, place them in a salad bowl. Cube the tomatoes and watermelon, add them to the beets. Whisk together the vinegar, salt and olive oil, toss into the salad. Serve the salad sprinkled with almonds and garnished with chopped mint. Serves 8. We first posted this recipe three years ago, after it had become a perennial favorite in our households. 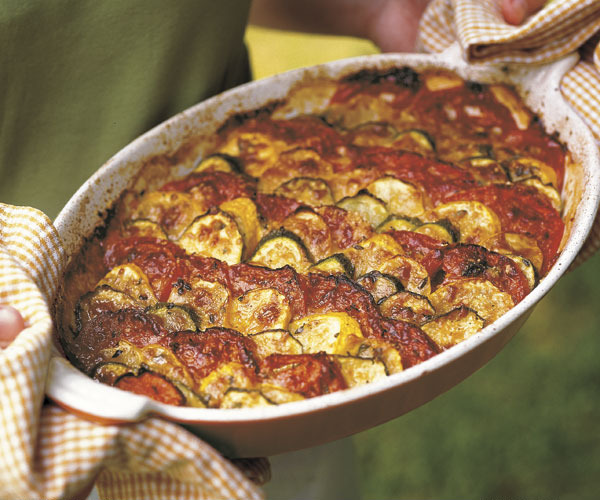 A go-to for using up summer zucchini, this gratin is hearty enough to satisfy winter appetites. The zucchini can be replaced with delicata or butternut, but you’ll have to increase the cooking time. The gratin also could be assembled and baked in the oven for about 30 minutes before being broiled. We demoed this for USBG as part of our January heirloom bean theme; we used fresh dried beans rather than canned ones. The original recipe came from The Washington Post so many years ago they don’t have it in their archives any more! Heat a skillet and add olive oil; when oil is hot, add zucchini and saute over medium-high heat until lightly browned; remove with slotted spoon and reserve. Add onion and garlic, turn heat down, cover and cook gently, stirring occasionally to prevent scorching, five minutes, until onion is soft and translucent. Add tomatoes, bring to a simmer, cook another five minutes. Add thyme, basil, beans and zucchini. Simmer five minutes, taste for seasoning. Pour mixture into a gratin dish and top with shredded cheese. Place gratin under pre-heated broiler five minutes or until cheese is lightly brown and melted. Serve immediately. Make the bread crumbs: mince the garlic in a food processor, add the cubed bread and process until coarse. Heat 1 teaspoon olive oil in a non-stick skillet over medium heat and add the crumbs. Toast until golden brown, about 3-4 minutes, stirring often. Set aside. Sauté the bacon in a large non-stick skillet over medium heat. Cook until crisp, then drain the pieces on a paper towel-lined plate. Pour off all but 1 tablespoon of drippings. If using turkey bacon, heat 1 tablespoon of olive oil in the skillet and sauté bacon until browned (turkey bacon will not crisp up like thick-cut bacon). Remove bacon bits from skillet, add another splash of olive oil if necessary. Add the cut tomatoes and sugar, cook about 5 minutes, until tomatoes begin to caramelize. Add the leeks and cook until wilted, 3-4 minutes. Deglaze the tomatoes with wine, simmer until liquid is nearly evaporated. Add the broth, vinegar, pepper flakes and simmer until reduced by 1/3. 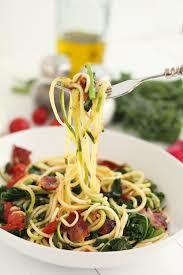 Add the spinach, bacon pieces and cooked spaghetti. Toss to coat, season with salt and pepper. 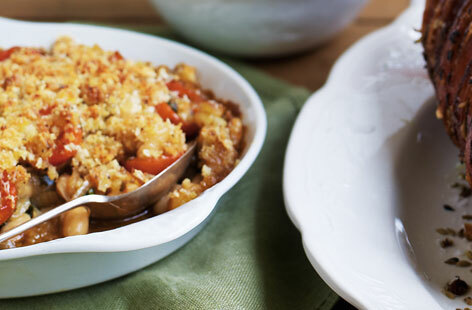 Divide the pasta between two plates and sprinkle with bread crumbs before serving. Serves 2. This lovely terrine makes a great first course, or, served warmed in the oven, a filling side dish. From Simply Recipes. Heat a grill or grill pan until very hot. Cut the eggplants into ½-inch slices and slices on both sides with oil, and sprinkle with salt. 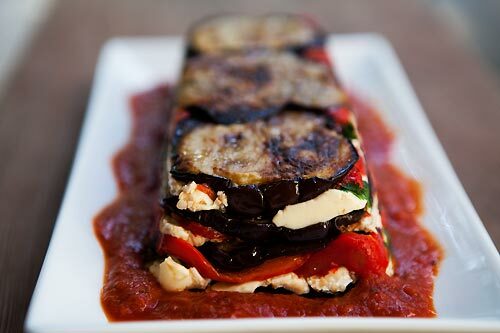 Cook the eggplant slices on the grill, covered, for 4 minutes on each side, until they are nicely browned and softened. While the eggplant is grilling, soften the parsley by blanching it in boiling water for 5 to 10 seconds. Remove, cool under cold water, drain. Line a terrine mold (loaf pan) with plastic wrap. Arrange a layer of eggplant in the bottom of the mold and top it with about a third each of red pepper pieces, parsley, and cheese. Repeat, beginning and ending with a layer of eggplant, until all the ingredients are used. Cover with plastic wrap and press on the wrap to compact the mixture. Refrigerate. Prepare the sauce. Place the garlic and tomatoes in a blender and blend until smooth. Optional, push the mixture through a fine mesh strainer over a bowl. Add the remainder of the sauce ingredients. Mix well. 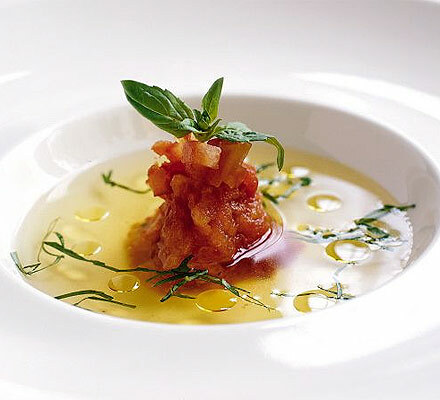 To serve, pour some of the sauce on a large platter and unmold the terrine in the center. Cut it into slices and serve with the remainder of the sauce.